January 31, 2004  American mezzo-soprano Lorraine Hunt Lieberson has taken an unconventional career path. She's not singing the big roles at the Metropolitan Opera that are every soprano's dream. Nor is she preparing a crossover album of classic pop tunes. Instead, Hunt Lieberson finds drama within lesser known pieces. Her recent recording of Bach cantatas was named one of the ten best classical albums of the year by the New York Times and is currently No. 3 on the Billboard classical chart. Jeff Lunden has this profile. January 26, 2004  Musician Joey Burns of the band Calexico talks about his song "Sunken Waltz" — a tune about the rampant suburban sprawl growing in the outskirts of the band's home base of Tucson, Ariz.
January 23, 2004  The Queen of Soul discusses her music, including her classic hit "Respect," her career and how she spends her time. January 22, 2004  When Carmen Lundy burst on the New York City jazz scene two decades ago, she impressed the critics and began collecting a devoted following of fans. 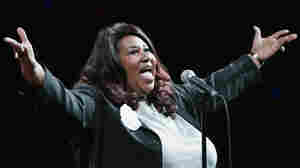 Seven albums later, she's still stunning audiences with her gospel-tinged, opera-trained voice. Hear full-length cuts from her latest CD. January 19, 2004  Before she made it big, Macy Gray was told she couldn't sing. And when she did sing, people would laugh at her distinctive voice, she says. Gray talks with NPR's Steve Inskeep about her inspirations, relationships and music. Hear songs from Gray's second CD, The Trouble with Being Myself. January 17, 2004  Sister Rosetta Tharpe was gospel's first national star and the first gospel musician to play night clubs like the Cotton Club. A new biography is in the works, and musicians continue to record albums and play concerts that pay tribute to the legend. Hear Ross Reynolds of member station KEXP and the Museum Experience Music Project. January 16, 2004  Like Whoa, Nelly!, her 2002 debut hit album, Nelly Furtado's new CD features diverse influences that reflect the young Canadian-born singer-songwriter's Portuguese heritage. NPR's Renee Montagne talks to Furtado about Folklore, which dives deeper into the texture and stories of her parents' homeland, the Azore Islands. Hear songs from the new CD. January 12, 2004  John Adams is one of the most oft-performed and influential living American composers. One critic has described his music as "giving the impression... of an open door which lets in the fresh air in great gusts." In the second report in Intersections, a Morning Edition series on artists and their sources of inspiration, NPR's Ketzel Levine talks with Adams about the music he's found in the written word. January 11, 2004  Two years before his death from cancer in 1991, tenor saxophonist Stan Getz entered the studio with producer Herb Alpert. The tapes were shelved at the time in favor of a more ambitious project; they were only recently found. Alpert speaks to NPR's Liane Hansen about his friendship with Getz and the '89 session, now on the CD Bossas and Ballads. January 4, 2004  Joshua Bell plays a Stradivarius violin built in 1713 that's been notoriously stolen a few times. On his latest CD, the young virtuoso borrows a few great classical melodies and transposes them. He discusses his results with NPR's Liane Hansen.